On Saturday February 9th, 2019 Inspire Peterborough, Amilly Fitness, Special Olympics Peterborough, Disability Peterborough, The Mobility Aids Centre, Oak Activities and friends are taking over The Cresset for the biggest disability sporting event Peterborough has ever seen! Better yet, it’s 100% FREE. Whether you’re coming to try our many sports activities, meet the Mayor, get disability or health advice, chance your luck on our tombola or the chance to win Olympic-style medals you’ll be in awe at the many things available to you. Athletics, Basketball, Boccia, Cricket, Football, Golf, Gymnastics, Horse-riding, Ice Skating, Swimming all led by Special Olympics Peterborough (suitable for age 8 plus with learning disabilities and additional needs), Campol Peterborough Boxing Club, Cerebral Palsy Sport Race Runners (stand up bikes), Dance with CDC Dance Company, Judo, Peterborough City Rowing Club, Peterborough Phantoms Para Ice Hockey Team, Sailability, Specialist Gym Equipment and Seated Exercise with Amilly Fitness, Tai Chi, Wheelchair Basketball, Zumba and much, much more. MC Chris Harper, The Mayor and Mayoress of Peterborough and Lady Isabella Naylor-Leyland will open the event, Peterborough Community Radio 103.2 FM will be broadcasting, meet the Special Olympics Mermaid Mascot and other guests to be revealed soon WATCH THIS SPACE. There will also be a market place of local health and wellbeing information and community groups including Cross Keys Homes, Little Miracles, Little People UK, Healthwatch, Cambridgeshire Deaf Association, Feel the Force Day, City College Peterborough, St Georges Hydrotherapy Pool, Stroke Association, Deafblind UK and Nene Park Trust. Special thanks to sponsors Peterborough City Council, Buckles Solicitors, Serpentine Green, The Horner Foundation, The Mobility Aids Centre and The Cresset. Stay tuned to the Inspire Peterborough Facebook page for information in the build up to this amazing event. We’ll let you know of all the changes, additions and must-know news. 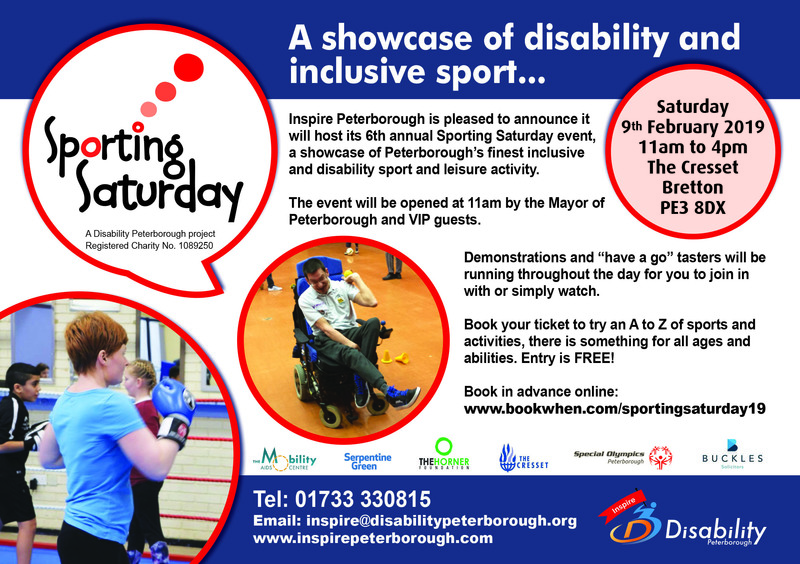 Everyone is welcome and the event is to showcase the wealth of inclusive and disability sport available in Peterborough for people with disabilities, their families and carers. We hope to see you on February 9th!